The world as it stands in Borderlands 2 isn’t a place; it is a strangely shaped arena. There is lip service paid to life on this rock, but none of it is convincing as all of it begins and ends within the sight of my gun barrel. Borderlands 2 begins with a cinematic opening, which both my friend and I though would make for an awesome opening for an animated series. We thought the same for the first game. Your posse of vault hunters are on a train in a firefight. Then it explodes, and the game begins with you waking up in the snow after the fact. From there, the game is an endless cavalcade of shooting dudes, looting chests, and checking menus to make various stat numbers go up. All the while, I struggled to figure out what was going on, as I was thrust from one objective to the next. Ok. We’ll assume for the moment that I accept that premise. Then what does Borderlands 2 do to differentiate itself from the rest of the pack of first person shooters? FPSes have been so ubiquities in the current generation of consoles that the mechanics have been fine-tuned to within an inch of their life by every developer under the sun. You walk, you aim, you pull the trigger, and enemies fall dead. There is only so much variation within that formula of actions. Context. Yes, that is important -- as when the basics of something become so refined that the only way to stand out and be something unique lies in how the game presents itself. I will grant that the world of Boderlands is different and the art style certainly lends itself to color, and a post-apocalyptic cartoon is the only way that I think I could describe this world adequately. But those are descriptors. None of that means that it’s good. I’ll hold off on the humor for a sec, as it fits into my next point. Borderlands 2 is different than most other FPS by virtue of its context, but fails to capitalize on it in any interesting way. See in the beginning when I have to follow a chatty robot named Claptrap, who insists that I am now his minion, I did so because that’s what you do in game. I had no earthly idea why I was following him. I had no reason other than that the game told me to. This bewilderment went on for hours. I was pointed to a group of baddies in a snowy shantytown, and I shot them. Then I went to an ice island and killed a bunch of 6-legged yetis. I’m not even sure that was part of a quest because after killing everything on the entire map, I went back to the starting area and walked in the other directions where I finally got more instructions. Eventually I started following some woman’s orders over the radio. I had no clue who she was, nor how she fit into any of this “get the three esoteric items to do a thing” quest that I was on at the moment. I met more characters and none of them ever bothered to explain what was going on or what their relationships to one another were. This went on for 10 hours. People talked and talked, but nothing was said, nothing was explained. I was hustled from one meaningless “to do list” to the next, making, as far as I could tell, no progress towards any sort of ultimate goal. By then, I had managed to piece together who everyone was and what the main conflict was about. But it was too late. The game had failed to contextualize. The world as it stood wasn’t a place; it was a strangely shaped arena. Nay, it was the prop sets of a high school amateur dramatic society. There was lip service paid to life on this rock, but none of it is convincing as all of it began and ended within the sight of my gun barrel. I will grant that there are moments when the game shows creativity or at least love for inspiring works. Some of the sidequests have a spark to them that made me smile in appreciation, but that soon faded as we got to the business at hand of shooting more dudes. I wont spoil them here because discovering them is one of the few joys of Borderlands 2. They are bright spots amid the dull monotony. I can appreciate what Gearbox is going for, but the execution falls short. Each rule or concept is fine on its own, but in combination they end up making the game routine. Samey shooting galleries broken up only by the need to loot chests or check the gun stats in an unwieldy and poorly thought out menu system. I’m getting more powerful because the numbers tell me so, but it never feels like it. I could take down enemies more easily, survive more punishment, but the game compensated by simply throwing more at me in a steady stream. I’m doing what I did before only in greater numbers. In the end, it all evens out. Not at all. It’s not a bad game, but it’s not a good game either. 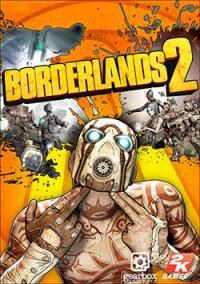 What’s depressing about Borderlands 2 is that it is a game designed to wile away your time. It doesn’t offer anything other than a method to pass 20-30 hours in mild contentment. Sometimes that’s what a person is looking for. A movie to watch for the afternoon that is fine while it is on and disappears from your mind as soon as it’s over, an airport novel to read on a long flight to wherever and the pages fade when disembarking, or the mindless pop music station that you listen to so you don’t have to drive to work in complete silence. If that’s what you need, then Borderlands 2 is the game to get.